Written by WILDmonkeyDESIGN on June 25, 2018 . Posted in Branding, Design, Identity Design. The term “brand” goes hand and hand with businesses, but it’s not limited to them, many things can have a brand, even you. Your brand is the perception that people have of you, the same applies to companies and pretty much everything else. Good design helps a company take control of their brand, and shape the public’s opinion to match how they want to be perceived. A company usually has a target audience, and it might vary from something broad to a tiny niche. If we know how the company wants to be perceived and who the design is for, the remaining question is, what is appropriate for them? Generally speaking, the broader the audience the cleaner and more conventional the design needs to be, that’s why you see many companies losing part of their “soul” as they grow. This happens because certain design gimmicks that will work for small niches won’t stick with a larger audience, therefore the company “sacrifices” that to attract more people. On the other end of the spectrum, when your audience is smaller and very specific you can rely on those gimmicks to make the design attractive and engaging to them. 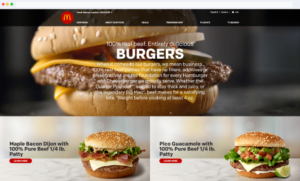 An excellent example to understand this is to compare McDonald’s with a local burger joint. They sell the same thing, but they communicate in very distinct ways. 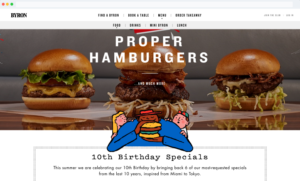 The local burger joint usually capitalizes on the latest trends in design that attract people who identify with that, like the funny illustrations you can see on Byron’s website. On the other hand, McDonald’s communicates more conventionally to cover a more general public trying not to patronize or alienate anyone. In short, to understand if a design passes this second checkpoint, we need to know what is the appropriate tone and if the design is successful in communicating it. If it is, then you’re one step closer to a good design. Do worry we will get there. Check in next week and see if the design stands the test of time!